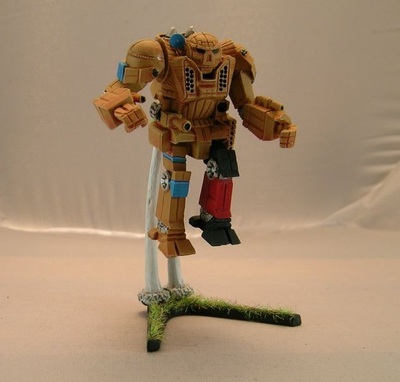 The Flamberge Prime model is from TRO (Technical Read Out) 3085, and was sculpted by D. Summers. It's also a 50-ton class mech. This model consists of 10-pieces. 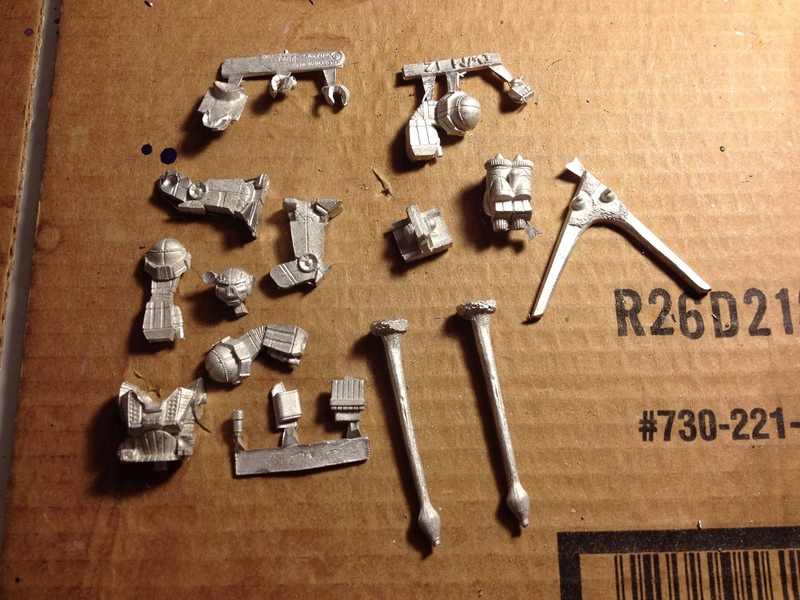 The package says 6, but I believe they count a piece as a sprue with multiple pieces on it. It also comes with a base that has somewhat scenic details (dirt?) on it. Assembly and cleanup was a breeze. The mold lines weren't too bad, nothing I couldn't handle with my hobby knife and small file. I think the only hard part was getting the little fiddly-bits, like the upper wing bits to stay in place at first. I should probably have pinned the wing-assembly in place too, it fell off a few times during painting. Hindsight right? Once assembled it's a really impressive model. I think I like the fact that it looks unique next to all the other mechs, because it has wings, which few have, and he's not sporting any very large bits of weaponry. To me it looks like a really nice recon piece. This fella consists of just 4-pieces. 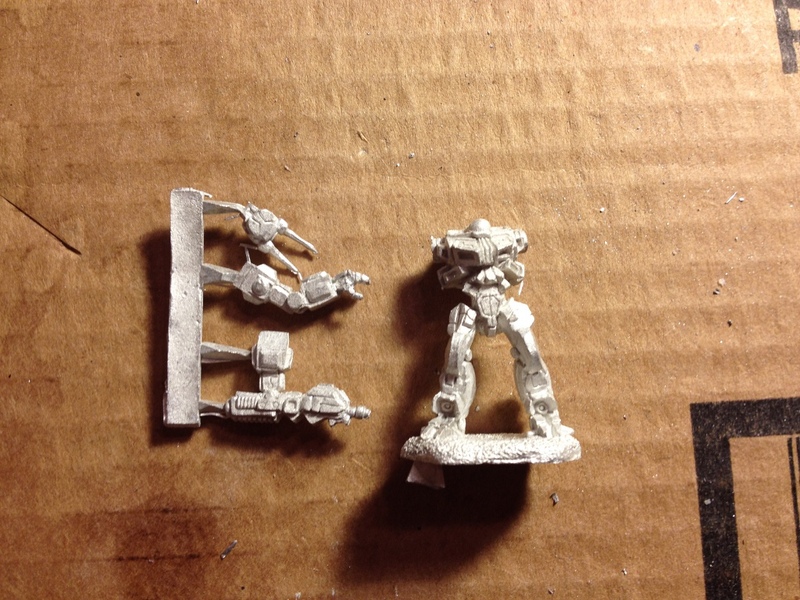 The packaging says 2-pieces, but one metal sprue and the body is what you end up with. 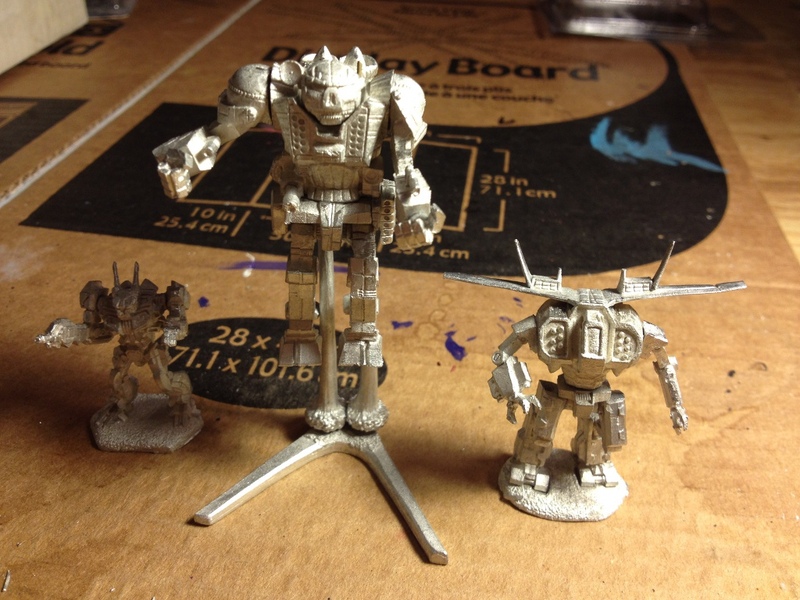 He's somewhat small, coming in at just 20-tons in comparison to other mechs. This version of the WASP is from the XTRO Primitives II, and he's also sculpted by D. Summers for Iron Wind Metals. Attach the two arms to the body, and position the head as you desire, and assembly is pretty much done. Mold lines and flashing was acceptable...nothing I couldn't handle in about 5-10 mins of usual prep work on a metal model. It's attached to a somewhat scenic base as well, essentially modeling nothing more than ground underneath it's feet. There's a lot of character in this sculpt. A lot of time had to go into sculpting the angles and armor-bits that make up this fella, and the end result is a very striking WASP model overall. Scale-wise he looks the part next to other mechs too. 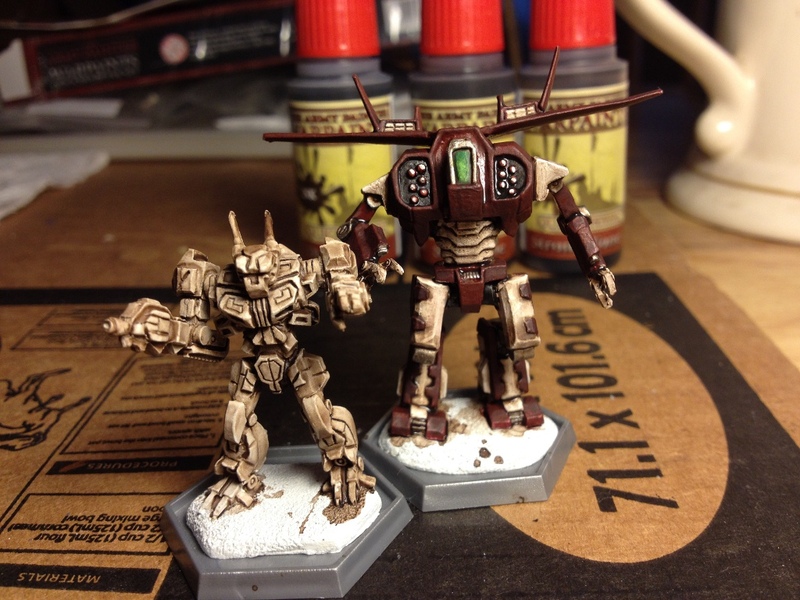 When I think of Battletech or even Mechwarrior in general, two mechs come to mind first and foremost the Madcat and the Atlas. Those two chassis to me are the two most iconic mechs you can find in all of the Battletech universe. So I was quite beside myself with excitement when I first laid eyes on this model. The Atlas is one of the largest mech chassis you can get, and being that it's in that 100-ton class... it's just not every day that you see one with jump-jets! 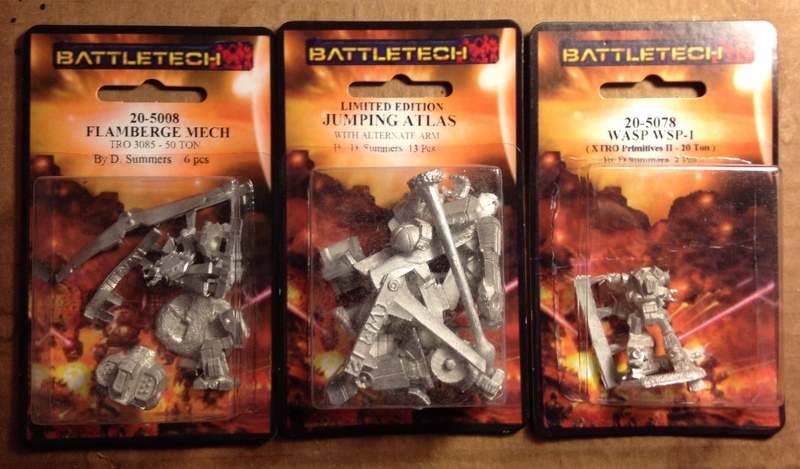 It never dawned on me that an Atlas would ever be equipped with jump-jets either. Nonetheless Iron Wind Metals made one, and it's a Limited Edition exclusive to their Online Store. This is a 19-piece model. The packaging does say 13-pieces, but again they're counting sprues and solid pieces in the blister-pack. Being this is one of he heaviest chassis, it's a rather large model in comparison to the others detailed in this article too. There's a lot of metal in this little blister-pack. Due to the weight and thickness of the metal I'd highly recommend pinning. I ended up pinning the upper torso to the lower extremities, and I pinned the arms and legs as well. Without pinning the legs can break free from the lower half due to gravity alone, as they simply dangle in the air due to the pose. 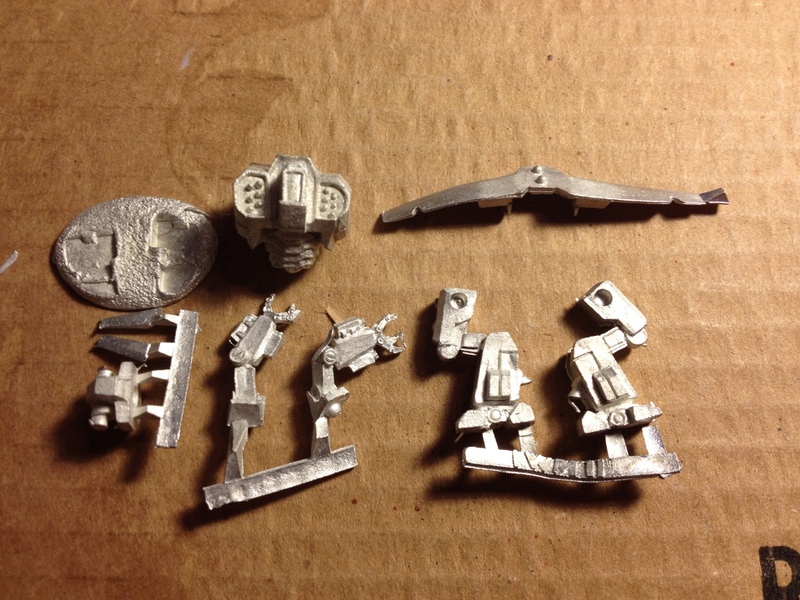 A few extra pieces are included, but I'm pretty sure it's because this is essentially the Atlas Resculpt model which happens to include the new pieces to add the jump-jets backpack. It also comes with a different arm and hand bit, and the exhaust bits that become the base for the model. The little V base that the exhaust bits are bound to actually hold the model surprisingly well. Cleanup involved a little more time than the others, but there's a lot more parts too. As stated earlier pinning should also be required to assembly this model, if you want it to stay together. Mold lines and flashing were also a little more time consuming, but again nothing out of the ordinary for a model this large, and made up of this many separate pieces. Dealing direct with Iron Wind Metals is the only way to get your hands on this one. There's actually quite a few different Limited Edition and Online Exclusive models to be had there, this one just stood out the most to me since the Atlas is one of the definitive Battletech mechs in my mind. One thing I really like about Iron Wind Metals is that they continue to pump out new models, and they seem to do so almost on a monthly basis even. The various time-lines that the Battletech universe fiction is set within in vast. Therefore they have a lot to work with, leaving a lot more great models yet to come. Of the three models reviewed here today... I have to admit that I feel the WASP WSP-1 has the most character. However the Jumping Atlas has the biggest presence on the table, and the Flamberge oozes coolness all around. It's hard to say anything bad about any of them. 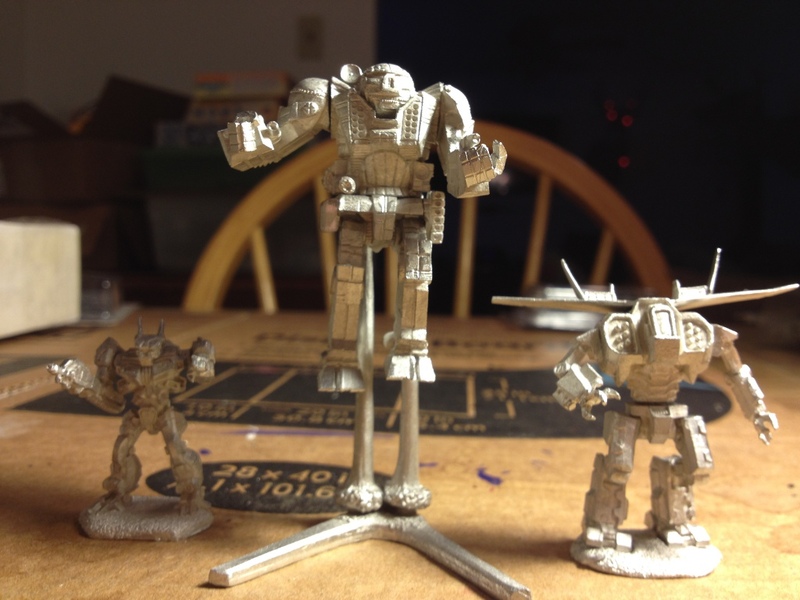 Most of you may already know this but for those that don't...Iron Wind Metals is the exclusive provider of officially licensed Battletech models. The Jumping Atlas will set you back $25 through their online store, and is Limited Edition exclusively through them. The WASP WSP-1 is just $9.50, and the Flamberge Prime runs $14.25. 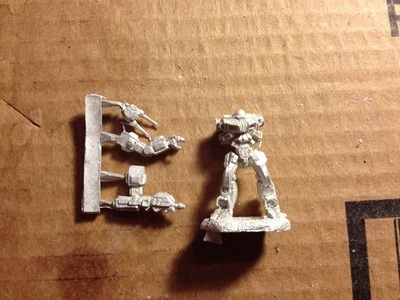 As with all Battletech models...these didn't come with hex bases either. 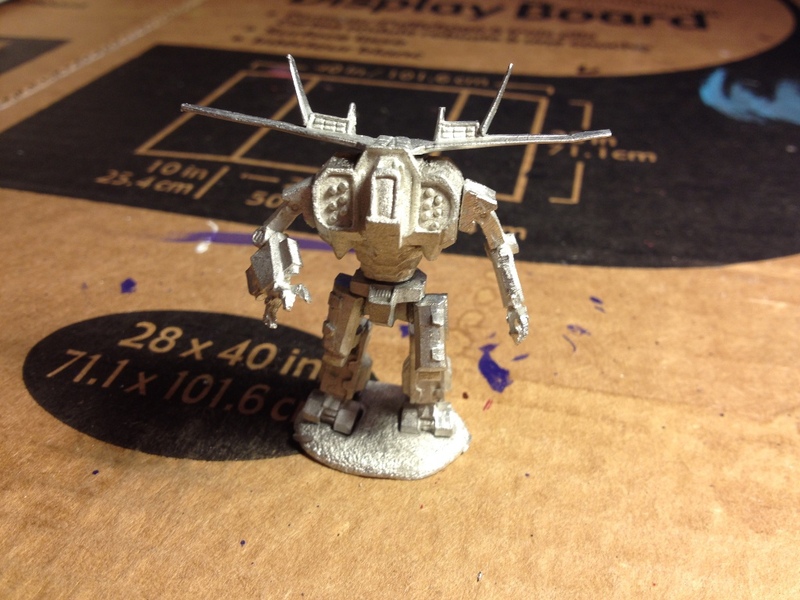 If you want to play traditional Battletech with the models they do offer very nice heavy metal hex bases you can purchase separately. 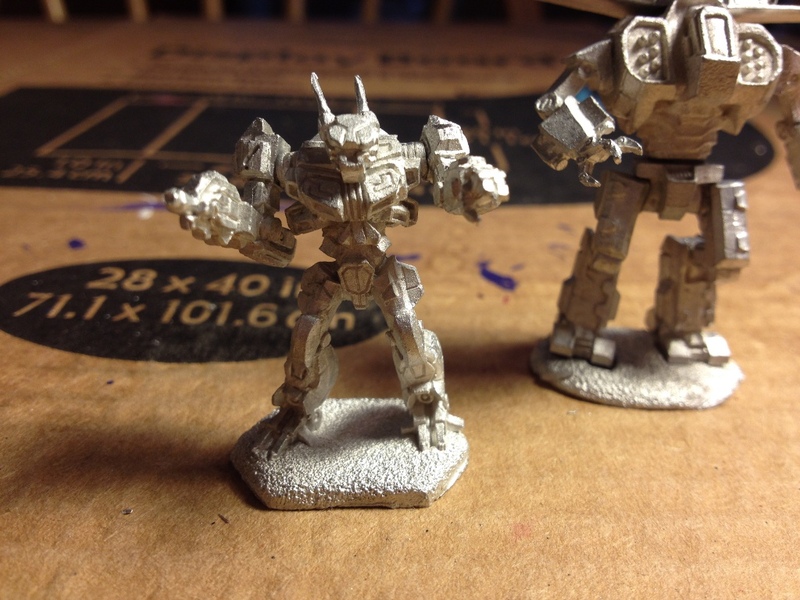 Also dig through the vault of articles I have here at WarGameGuru and you'll find a rather in-depth article covering some plastic hex-base alternatives as well if needed. Having been a big fan of the defunct Wizkids Mechwarrior game as well... I was also surprised to learn that just next month they'll be releasing the Atlas III from the DarkAge/3145 time-line! Alongside it will be the Wulfen Prime and Hollander III. At long last many of us old Mechwarrior players can get our hands on some beloved models from that era now too in glorious metal form!